Not listening to Satori Junk is like not eating at a fine pizzeria because they don't have the 'original' pizza. Please take a minute to think about that first sentence. I will come back to it at the end of this review. It's not just because Satori Junk is an Italian band. But if you want another pizza-reference, here it is: Satori Junk is an excellent quatro stagione, using the best 'vintage' ingredients to make a product that every single doom fan should like. Anyway, let's start reviewing this album. This untitled album is Satori Junk's debut, released by Taxi Driver records. It will be available on March 3rd, both on CD and as a digital download. In a bit over an hour this album will take you on a psychedelic journey, highly influenced by the likes of Black Sabbath, Electric Wizard, Sleep and often even The Doors. These Italians seem to know a thing or two about heavy riffing because what they create is pretty stunning. There's a lot of fuzz on this debut and the vocals are mixed a bit towards the background. 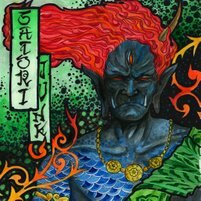 Borrowing from both vintage doom metal and seventies psychedelica, Satori Junk incorporates some other interesting aspects in their music as well. 'I put the hotdog toward my mouth and someone was screaming' is probably the most remarkable piece of sampling I've heard in a while. I don't really know where it comes from but it does help to make 'Shamaniac' one of my favourites on this album. So do the synths. Sometimes they sound like a Hammond-organ and sometimes like a theremin. This gives the music an odd touch, reminding me of weird horror b-movies. At some points Satori Junk likes to speed things up a bit, which is a huge plus. It gives the album a decent amount of variation that I often miss in this genre. 'Blessed Are The Bastards', for instance, is a pretty heavy rocker, reminding me a bit of Winter's 'Servants Of The Warsmen'. It's also this tempo change that makes 'Spookie Boogie' a surprisingly happy doom 'n' roll track. Like the earlier mentioned Winter song did with me, these up-tempo songs can get many metal fans into listening to this band.